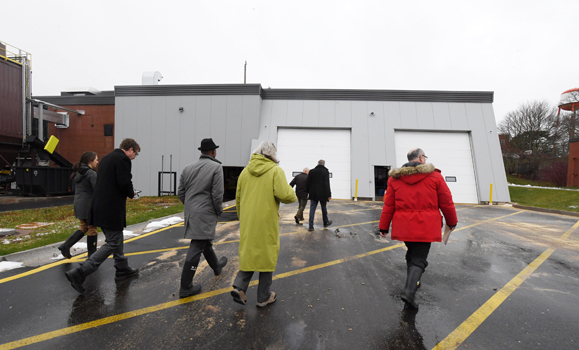 Dal’s Agricultural Campus has its sights set on being completely carbon neutral — a goal highlighted at the opening of the new Biomass Energy Plant, which celebrated its grand opening Tuesday morning (Nov. 20). The renewed plant and district energy system, a $26.5-million project that began operation this summer, burns biomass fuel in a thermal oil heater. This heat moves a new 1 MW turbine to create electricity — an organic rankine cycle (ORC) system that’s the first of its kind on a North American university campus. It’s technology that places Dal on the leading edge of sustainable technology and renewable energy practices. “We have taken a 30-year-old traditional heating plant and renewed it to be a cutting-edge biomass system that meets our campus heating needs and creates electricity that we then sell back to Nova Scotia Power,” explained David Gray, Faculty of Agriculture dean and campus principal, at Tuesday’s event. The project also saw the entire Ag Campus steam distribution system replaced with a district hot water system — 2.6 km of piping. The waste heat from the electricity generated is used to heat the campus. The result is a system that, overall, is 30 per cent more energy efficient. Dal partnered with the Province of Nova Scotia on the project through the COMFIT program. In 2014, Dal was approved to join the program, which encouraged community-based renewable energy projects by guaranteeing a rate per kilowatt-hour for the energy that feeds into the province’s distribution electrical grid. Part of Nova Scotia’s ongoing efforts to reach 40 per cent renewable electricity sources by 2020, the COMFIT program was designed to broaden ownership of renewable electricity in Nova Scotia and facilitate community investment in electricity projects. “What we’re trying to do is support local economic development and try to balance our supplies while being innovative,” said Rochelle Owen, executive director of the Office of Sustainability, recognizing the suppliers in attendance at the event. Guests were also able to get an up-close look at the new biomass fuel thermal heater, which will enable a more consistent and higher heat burn creating less ash and more efficient use of biomass. Then there’s the ORC system, projected to produce 7750 MWh annually (roughly 75% of the campsu electrical usage) — more practical than a steam turbine because it can use lower grade heat while remaining just as efficient. 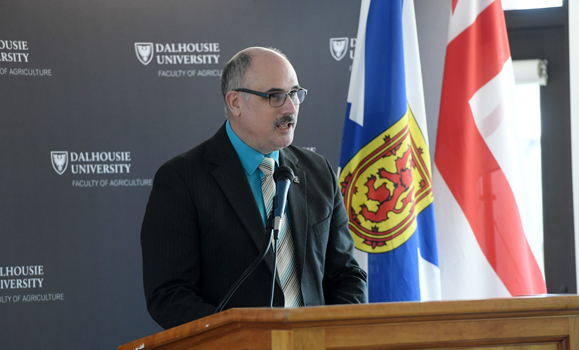 “It’s a great example of the leadership, the innovation and the forward thinking that is taking place at Dalhousie University,” said Environment and Climate Change’s Jeff Corkum at the event. Peter Cherry leads the tour. 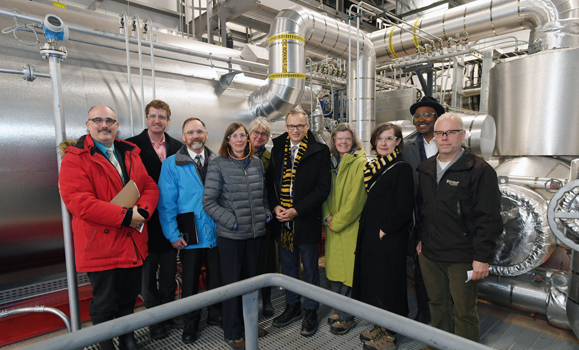 The new Biomass Energy Plant plays a part in Dal’s ongoing efforts to improve the sustainability of its operations and reduce its carbon footprint. Over the past decade, the university and its partners have invested more than $93 million in sustainability-related projects on campus, and the university has a gold rating from STARS, an international leading rating sustainability system for universities and college. Though it has only been part of the Dal community for six years, the Agricultural Campus is at the forefront of these efforts, with the goal of reaching carbon neutrality. Major energy projects completed to-date on the Ag Campus include a full lighting upgrade, house insulation upgrades and smart metering installation. Key projects on the horizon — and opportunities for philanthropic investment — including a sustainable dairy centre, renewable wind and solar energy production and a second phase of the biomass system that would maximize waste heat usage in the summer. Left to right: David Gray (Dean of Agriculture), Iain Rankin (NS Minister of Lands and Forestry), Jeff Corkum (Regional Director of Atlantic Environmental Protection Operations, Environment and Climate Change Canada), Rochelle Owen (executive director, Office of Sustainability), Christine Macy (Dean of Architecture and Planning), Richard Florione (President), Teri Balser (Provost), Susan Spence (Vice-Provost Planning and Analytics), Ivan Joseph (Vice-Provost Student Affairs), Peter Cherry (Facilities Management).